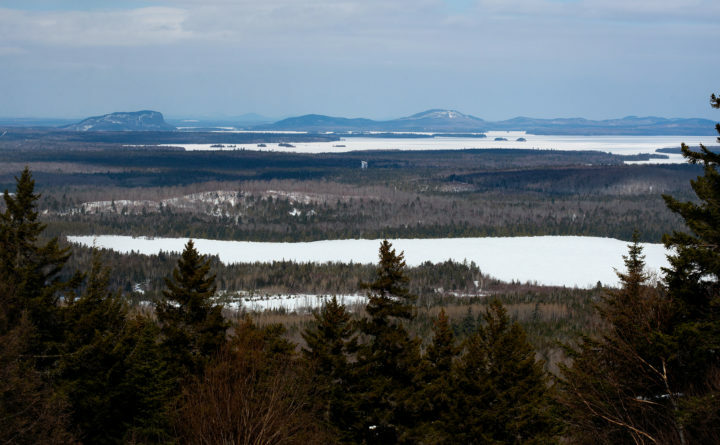 A view of Mountain View Pond and Moosehead Lake from the Big Squaw Mountain ski area in Greenville. Maine’s Land Use Planning Commission (LUPC) proposes to eliminate rules that limit new development applications within 1 mile of clusters of similar development anywhere in the Unorganized Territories. The new proposed system would allow new development applications of any type in designated zones along any public road within 7 miles of 41 towns they have designated as “rural hubs.” These zones encompass approximately 1.3 million acres. Will this new system of planning for development in the Unorganized Territories improve the economy of the rural hubs and the living standards of the people who live there? Admittedly, each system has its advantages and disadvantages. LUPC staff tell us the big disadvantage to the current system is that development can “leap frog” and sprawl across the UT over time. Landowners in favor of the new 7-mile zones complain there are not enough development opportunities in northern Maine, so why haven’t we seen this “leap frogging” happening? It is a fact that the population of Maine’s Unorganized Territories and many of the towns near the UT have decreased and school enrollments declined. This is not a problem unique to northern Maine. Rural areas across the nation are grappling with the same issue. A look at recent MLS real estate listings reveals that many towns in northern Maine that are surrounded by unorganized townships already have an abundance of building lots, homes and vacant storefronts for sale. This indicates a ready supply for a level of demand that doesn’t exist. Look at Plum Creek Timber Co.’s (now Weyerhauser) subdivision near Moosehead Lake of thousands of acres from a few years ago. All of that remains undeveloped. New subdivisions in the Unorganized Territories surrounding the rural hubs are likely to be marketed to and purchased by nonresidents looking for the opportunity to build seasonal camps or second homes. This type of landowner will not increase the local school enrollment or add much to the year-round economy. Most importantly, property taxes from any new building lots and camps will go to the state of Maine, not the towns, while the demand for services such as fire protection, ambulance and law enforcement will be increased. Maine’s largest landowners have done a great job managing their lands for timber, recreation and wildlife while maintaining a working forest that is accessible to the public. We are very lucky here in Maine to be able to access thousands of acres of privately owned land for recreation. Properly sited and permitted resource-based commercial developments that enhance the viability and health of the forest industry can help landowners who are committed to growing forest products sustainably retain their land as working forest and wildlife habitat. However, increasing the areas in the UT that can be rezoned for residential subdivisions with lot sizes up to 25 acres around towns such as Greenville, Jackman and Millinocket will no doubt lead to strip development, fragmentation of working forest and wildlife habitat, and more “no trespassing” signs in the North Maine Woods. Promoting more subdivisions along miles of roads within undeveloped townships is not going to be the cure-all for the economy of the towns in northern Maine. The LUPC should work to promote growth within the small towns and rural hubs rather than degrading our most valuable asset, the natural resources that make Maine unique in the eastern United States. Jonathan Robbins of Searsmont is a Licensed Forestry Consultant. He is an active member of the Sportsman’s Alliance of Maine, Trout Unlimited, and Backcountry Hunters and Anglers.